Seriously guys, I have SEW many sewing machines! (I’d tell you that I’m sorry for the pun, but I’m not.) 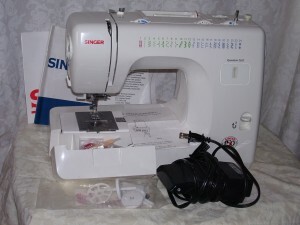 I currently have no less than 6 sewing machines in my house. And in the last month I’ve had at least 3 offers from people wanting to give me their vintage machines. Unfortunately, what with space and all, I had to turn them down. I really have too many sewing machines as it is, but I love them so. I have my everyday workhorse machine, which is a Singer Quantum 2623. 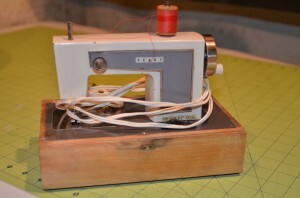 This is the machine I keep set up in on the counter in my sewing space, and use for almost all of my projects. It’s certainly nothing fancy, but I like that about it, because I don’t have to worry if something happens to it. I also have an old Bernina machine that my husband purchased from the Home Ec department at the school when he was teaching. It’s similar to my Quantum, so I use it as a backup when the Quantum is in being cleaned, and usually having the tension adjusted. I would have to say that the pride and joy of my little collection of sewing machines is my Singer Featherweight. The hubs got it for me for Christmas a few years ago, and I absolutely love it. Because it only does a straight stitch, I just use the machine for quilting projects, but I am always happy with how the projects I make with my featherweight turn out. I also have a couple of vintage Singer sewing machines in cabinets. 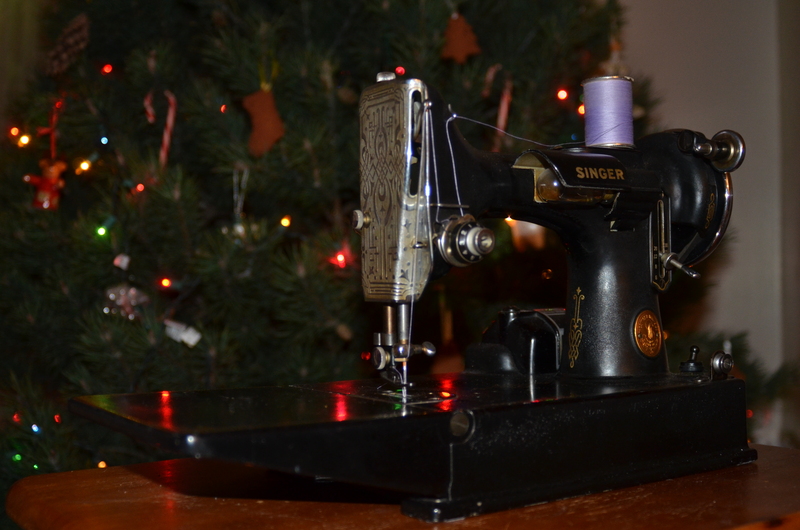 My favorite is the Singer 66 “Red Eye” Treadle machine that my husband purchased for my birthday last year. Everything on the machine appears to be in working order, but I haven’t really used it to sew yet, as the lady I purchased the machine from used it as a decorative piece and I’m wanting Matt to oil the machine before I try figuring out the whole treadle thing. I also have a 2nd Singer sewing machine that lives in a cabinet. It’s a vintage machine, but nothing too fancy. I used to use it some before we moved, but it’s a little hard to now, as our record player sits on top of the cabinet, with all the records stored underneath. 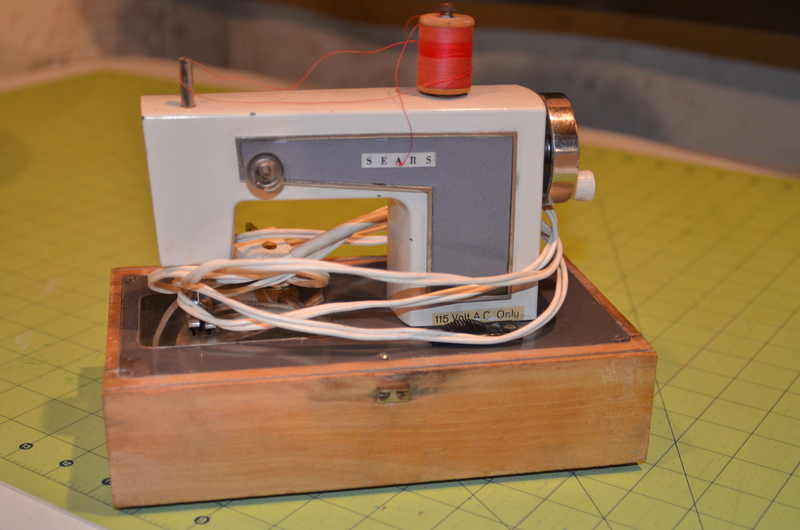 And the smallest, but probably cutest sewing machine in my collection is a vintage Sears Toy Sewing Machine. It’s a nifty little thing that sews with a chain stitch, meaning that it doesn’t require a bobbin. I haven’t actually gotten to use it for anything yet, as it’s missing part of the tension mechanism, but I am keeping my eye out for that little bit. You have 6 sewing machines, we have 6 DVD players. And we use them all. Usually one or other is in the repair shop because we use them so much. I have one in the living room for English classes, DH has a couple in his den, there are three in the bedroom…yes, we’re odd. I also own two tablets, a PC, and two ebook readers (because one finally died on me. I used to have three. I don’t sleep much and there’s nothing worse than being out of batteries at 3 AM when you don’t want to switch lights on to read!) I’m down to 1 Mp3 player from 2…one for audiobooks and the other for music. This is annoying, but I’m trying to get the better of it. They are ALL beautiful! 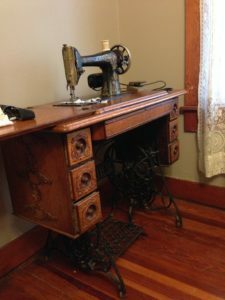 We have a treadle machine and I want to be able to use it too. I’m assuming it would qualify as a industrial machine though. At least, that’s what I hope. Thanks for linking up to Thread Filled Thursdays! I always love your posts!